가야금 산조는 개인의 독주곡형식의 장르로 12현 가야금으로 연주되는 기악독주곡이다. 개인의 음악적 기량과 다양한 테크닉을 선보일수 있는 구조로 느린 템포부터 점점 빨라지는 악장의 구조와 리듬패턴을 가지고 있다. 가야금산조 중 가장 여러 악기의 산조 선율을 자유로이 넘나드는 유대봉제 백인영류 산조를 기타와 타블라의 반주에 맞추어 연주 할 예정이다. The late Mr. DaeBong Yoo is a revered composer and 12-string gayakeum master in Korea. This performance in-memoriam will feature a segment of his famous work against some improvisational commentary and harmony from the western guitar and Indian tabla. Professor Gye Oak Kim is a Chinese-Korean composer and 25-string gayakeum master. She was born in China, but currently resides in Seoul, Korea as a faculty member at the Korean Traditional Performing Arts College of Chung-Ang University. For this event, the piece will be played as a dialogue between classic guitar and 25stringed Gayakeum..
한국 최고의 가야금연주자이며 작곡가인 김계옥교수의 작품으로 우리민요 "아리랑"을 주제로 연주된다. 다양한 한국전통 리듬에 맞춰 아리랑 선율이 흐르는 25현 독주곡 아리랑을 트리오로 구성해보았다. Mr. Ho-Joon Hwang is a young, much sought after composer in Seoul, Korea, whose works range from folk-based contemporary solo, ensemble and orchestral pieces to avant garde cross-cultural experiments in music. This piece is one of his more recent works, and by his own account, it was inspired on the breathtaking slopes of Andalusia, Spain. 한국에서 현재 가장 촉망받으며 국악작곡계의 리더를 맡고있는 황호준씨의 작품으로서 스페인의 안달루시아의 언덕이라는 주제로 한국 고유의 리듬에 스페인의 음계를 가지고 마치 플라밍고 춤을 추듯 연주하는 인기 연주곡이다. 월드뮤직이라는 장르에 새로운 방향을 제시해주는 듯하다. Multi- Cultural Improvisation based on Korean Traditional Spiritual Music. The exotic sound of Indian Tabla and Korean traditional instrument, Gayakeum and Western Classic guitar will make a collaborative harmony in Korean improvisational Music, Sinawi. ​Sina (시나), the free-spirited musical traveler, is coming to the Washington D.C. area for a unique performance at Soricha Tea & Theater. Accompanied by the Cristian Perez Trio, Sina will bring her unique mix of French, Brazilian, and Jazz. Don't miss it! 자유로운 영혼의 뮤지션 Sina (시나)가 소리차 Tea & Theater에서 공연을 펼치게 되었습니다. Cristian Perez Trio와 시나가 함께하는 French, Brazillian, 그리고 Jazz 공연! 놓치지마세요! With a strong foundation in classical guitar, jazz, and South American music, Argentine guitarist/composer Cristian Perez has crafted a unique musical voice that strives to explore the sounds of music from around the world without limitations. 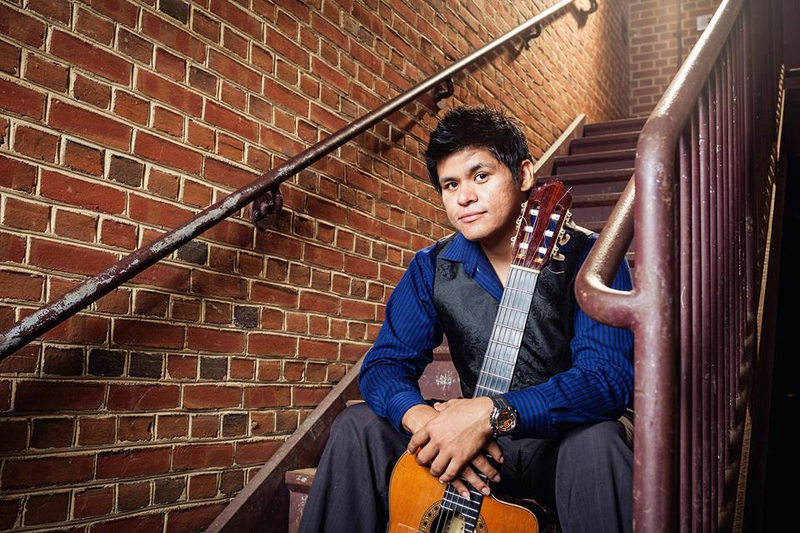 Cristian has a Masters in Music from GMU, and was an artist-in-residence at Strathmore. Cristian was a featured artist in Vintage Guitar Magazine, and his debut album "Anima Mundi" (2016) has been well-received across the globe. Music is a journey toward freedom. As a musician, Sina meets a lot of people on the road and fills each and every moment of her life therewith. Selected one of the Best 10 young talented singers by European Modern Music Education Network (EMMEN) and Federation Nationale des ecoles d’influence Jazz et Musiques Actuelles (FJEIJMA), she began her musical journey as a vocal for her college rock band. Having grown with music while juggling between rock and pop, SINA studied jazz vocal and jazz piano at CIM (in France), Europe's first jazz school, thus broadening her musical horizon. Continuing her various activities in France, she has presented three albums, from SinaKowan, "Korean Music Jazz-Folk" which reinterprets traditional Korean music, SinKowan Trio "So Nice" which collects her created titles, and Sina Hyunju Nam "Hors du temps" which she came up with by participating in a chanson project by a French producer. In Korea, she is currently conducting various musical experiments as leader of Brazilian Jazz Band “Sina & Nanasai”, French Chanson Band “Sina & les célibataires”, and Samba Choir Alegria which sings Brazilian music. Besides, she is continuing her free-spirited musical journey that juggles between jazz, pop, and Brazilian music through her independent project, "Silent Trip". 그 길 위에서 수많은 인연을 만나고, 삶의 순간을 채워가는 뮤지션 SINA. 대학시절 Rock Band의 보컬로서, 그녀의 음악 여행은 시작되었다. 재즈보컬과 재즈피아노를 공부, 음악적 지평을 넓혀 간다. Sina Hyunju Nam “Hors du temps”까지 총 3장의 앨범을 발표한다. 브라질 음악을 노래하는 Samba Choir Alegria의 단장으로서 다양한 음악적 실험을 진행하고 있다. 넘나 드는 자유로운 음악여행을 이어가고 있다.